At the moment, I'm sort of trying to re-invent my sports-top. For indoor climbing, you don't really need special clothes. And you see climbers wear lots of different things, usually at some point between normal casual clothes, sportswear and outdoor stuff. I'm usually at the sportswear end of the spectrum (preferably no leggings though). You see, as a climber, you develop the muscles in your upper body (and legs and core, but those are less relevant for this) and more so at the back than at the front. And stronger muscles get bulkier. I can already notice that my sports bras have started pulling just a bit at center back. On a much more experienced and much stronger climbing friend, that pulling is so bad it is actually painful. And it is really hard to find tops which won't have that effect. 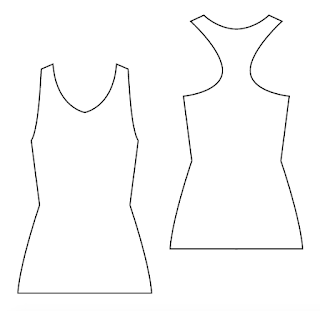 This is the generic shape of a sport top (and most sport bras), both in ready-to-wear and in sewing patterns. You sometimes so some design changes but most of those are not actually functional. 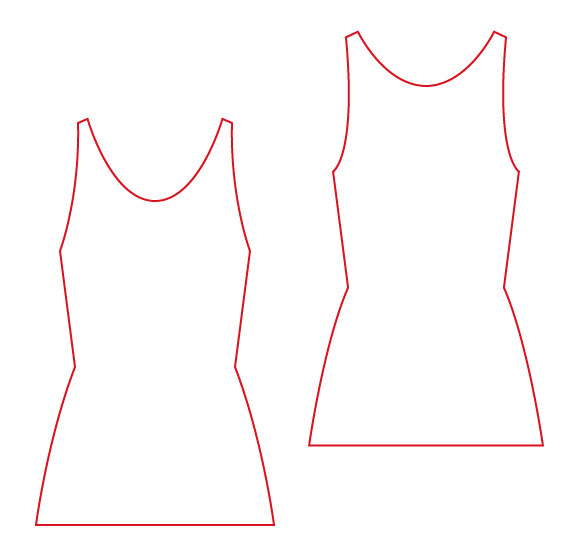 As far as fit and function are concerned, they stay true to the racerback shape. 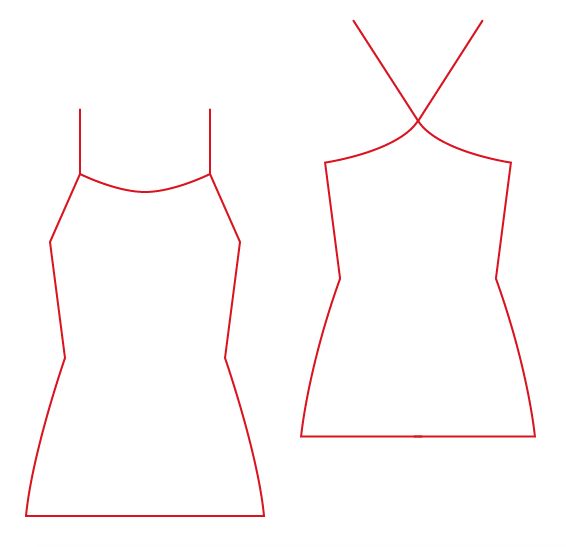 That shape allows for great freedom of movement, it makes it impossible for the shoulder-straps to slide off and it also does a great job at holding the garment close to the body so it can support the wearer's bust. All good things but to do that, it has one shape and one size. 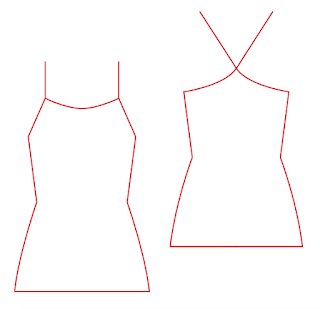 If the wearer does a sport which develops the muscles at the back and shoulders, that trusty top doesn't fit so well anymore. By the way, I would be interested to know if this is an issue which is specific to those of us who are climbing and bouldering, or whether it happens to everyone who does any sport which causes muscle development in the upper body. 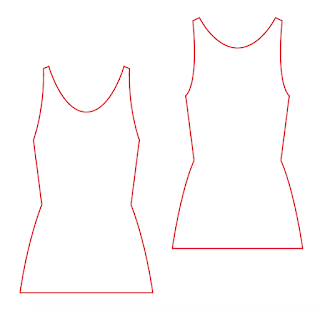 I will basically replace the cut-and-sew racerback with bra-style straps which can be adjusted with sliders. The set-up is very similar to what I use for my racerback bras (which are still very comfortable). A shape like this might offer less bust support but, with my cup size, I'm not really worried about that. 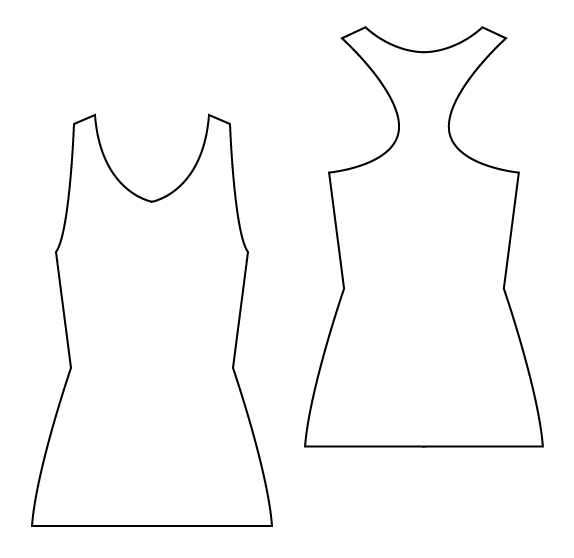 Another option might be to go with the same shape you often see for normal vest tops (like the ones I have been climbing in so far). Those straps sit a bit further away from the neck and most of the material across the back is just stretchy fabric, not the more solid elasticated edges. I'll have to try it out but based on my (rather limited) experience so far, it might work. I'd like to make a comment that's a bit off topic. Beware of getting muscle imbalance. If you do a lot of exercise and get very strong muscles in one area, and aren't careful to strengthen the opposite ones (in climbing chest muscles aren't used as much as back ones) you set yourself up to being prone to injury. I played racquet sports (including VB, where your arm/hand is your racket) and developed my front much more than my back. I also swam and lifted weights, but it didn't balance out. My F is a size 14 and my back is a 12 in Big 4 patterns. I prefer the non-racer type sports bras for the same reason - I experienced similarly expanding back muscles when I started strength training. Now I wear sports bras that look like normal bras (hook and eye closure, no underwire), and one-to-two sizes bigger sports tshirts over them. I really enjoy my panache sports bra as it's "convertible" and can be worn with the straps joined at the center for extra support, or separated for more comfortable movement of the shoulders. It also provides excellent support, which is not common in higher cups sports bras.